The main trunk and branches of this sculpture are made of 20 and 26 gauge steel galvanized wire, giving the surface a matte gray finish. 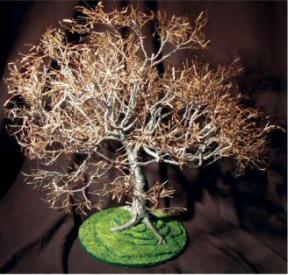 The outer twigs and hundreds of hammered leaves are created of 26 gauge brass wire. The combination of the two types of wire gives the sculpture a lifelike and very full appearance. In contrast to the multi colors of the tree, the sculpture is planted into a simple 8" round grass covered base. The grass is created by using several types of sand which is painted in green, yellow and white and which will not fade.